These supplies are limited so if you're interested please email snugharbormusic@gmail.com for order information and details. Digital copies of our music is also available for your listening pleasure on iTunes. Snug Harbor - "This Is Snug"
The newest release from Snug camp is this completely original, funky gem. It's got new members, new music and most of all it's in the groove. It was recorded in February and released on July 27, 2013 by Spencer Bell at Top Shelf Audio as well as mixed and mastered. To purchase this album you can send us a check or through Paypal. For more inquiries please send an email to snugharbormusic@gmail.com and we will set you up with your own copy! 'Snug Harbor' is the debut full-length album from the 7 piece funk ensemble. It was recorded during a three day stretch (Jan 7-9, 2011) in which the group and engineer Chris Vita put in 40 hours of work. Although incredibly exhaustive, the magic that happened at Fastback Studios in Seattle, WA is on display in this CD. Snug Harbor is very excited to bring you this album, comprised mostly of all-original contemporary funk music. Additional recording was done on Jan 12 at Fairhaven Studio and it was mixed by Chris Vita and mastered by Gus Elg from Sky Onion Studio. Thanks to Blank Studio, Bison Bookbinding and Letterpress and Rocketrom who helped us with our post-production needs. Snug Harbor "Sounds From the York"
"Sounds From the York" is Snug Harbor's first official album. It was recorded live in-studio at Fairhaven Studio in Bellingham, WA engineered by Chris Vita. The album was recorded in the fall of 2009 and released at the turn of the year. Only a few physical copies remain of this album, if you're interested please send an email to snugharbormusic@gmail.com or feel free to download the album on iTunes. Lots of sizes available in both Men's (Green) and women's tank tops (charcoal). Lightweight and perfect for the summer! 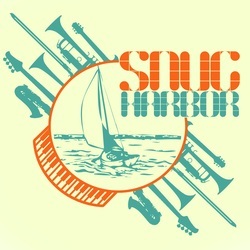 Snug Harbor "logo tee's" are now for sale! Printed locally in Bellingham, WA by INNATE, we are proud to offer these limited edition items. Email us to place an order today we have Women's small-large and Men's small-xl, place an order today to ensure your size is still in stock!